Marquette crushed UWM into a fine powder tonight at the Bradley Center. After 9 years of not playing this series, Marquette showed no mercy in sending the Panthers back across town with nothing short of a mighty beat down. Marquette is 35-0 against UW@Milwaukee. There's really not much more to say. DJ lead the team with 22, Lazar with 19, Coobie with 12, McNeal with 16. MU shot a blistering 53% from the field. Marquette had an amazing 26 assists to 7 turnovers. Christopherson got in his first official Marquette game and scored his first bucket. Oddly, it wasn't a deep 3, but a put-back in the paint. Dan Fitzgerald was dressed for tonight's game, but did not play. He was sporting a brace or cast on his left wrist. Marquette has not released information as to the extent of his injury, or when we can expect him back. Attendance was excellent, at 18,300, just a few short of a sell-out. Certainly the first year of this 5 year series was worth the cash-outlay by Marquette. Large turn-out, and big-time thumping. and there are plenty of tickets available for the game, one that is an 'important issue to.....fans of college basketball and the city of Milwaukee' according to an athletic administrator in town. Some fans are SHOCKED.......SHOCKED I tell ya! that seats remain -- good seats -- for this much anticipated game between Marquette and a low mid-major. Remember, this is a game that could have been played in Miller Park in order to accommodate 20,000 fans. Heck, the Milwaukee Journal-Sentinel even redefined the term 'rivalry' when the series was announced. Note to Bobbi Roquemore and Bud Haidet; 34-0 does not a rivalry make. Nor does low mid-major fan apathy. As of this morning, fans can buy 10 seats together for Friday's game and sit along the sides of the court. No need to fill the corners for Al this time. Sorry, Trend. Missed your birthday this weekend. The Duke Blue Devils were too much last night, edging the Marquette Golden Eagles to win the EA Sports Maui Invitational 77-73. MU played well in defeat - - Duke was just a bit too much. The Golden Eagles had no answer for Kyle Singler and DeMarcus Nelson, and failed to finish on any number of near gimmes in the lane throughout the game. Tough loss, but the energy and effort were outstanding. Lazar Hayward led MU with 14 points. Jerel McNeal and Dominic James were selected to the all-tournament team. A blogger from "Rumors and Rants" .. they appear to be a general sports blog. One of their writers attended Maui and wrote about all the games. His recap of the MU/Duke game is well worth the read. We'll keep this simple ......... Marquette graduate and Cracked Sidewalks contributor Chris Altruda previews today's tilt in Maui for the Associated Press right here. Tipoff is scheduled for 6pm CST. The game will be broadcast on ESPN. Don't forget to chat during the game over at MUScoop. The Tulsa World recaps the Cowboys' 83-77 win over LSU. Rosiak on MU's underwhelming performance yesterday. It wasn't pretty to be sure, but the Marquette Golden Eagles defeated host Chaminade in the first round of the EA Sports Maui Classic by a score of 74-63 on ESPN2. The win marked the 5th consecutive pre-season tournament opening round victory in the last 6 years. In each of those previous years, MU had mediocre results against their first round opponent but managed to capture the tournament championship. MU was led today by Jerel McNeal's 22 points with Lazar Hayward chipping in 15. The game was largely in control by MU, but in several instances they let the Silver Swords hang around to cause some angst among the fans. In the first half MU jumped out to a sizeable 14 point lead only to have Chaminade close to within 9 at the break. The Silver Swords opened the second half with a 6-0 run and trailed #10 ranked Marquette by only 3 points. Slowly MU regained it's footing and held control of the game until roughly the mid seven minute mark when Chaminade again cut the lead down to just three points. Jerel McNeal took over at that point on a missed free throw by Hayward. McNeal came out of nowhere to tip it in with his left hand and put MU up by five points. Chaminade never got closer the remainder of the game. Concerns from this game remain the same from earlier this year and most of last year. Poor shooting and poor interior defense. MU shot only 2 for 15 behind the arc and were killed by Chaminade's big men. MU was outrebounded for the game, something Tom Crean certainly will address with his club before tomorrow's contest. Marquette will play the Oklahoma State Cowboys in the semi-finals. On Monday, #10 Marquette will take on the Chaminade Silver Swords. Tip time is 1:30pm, MST (Marquette Standard Time) in the Maui Invitational at the Lahaina Civic Center (capacity 2,400). The game is broadcast on ESPN2, but if you're stuck at work, it's possible the game will be online here. (IE Only). Marquette has done well in these pre-season tourneys, winning the Great Alaska Shootout two seasons ago, and CBE Classic last year. Chaminade is a Catholic (Marianist) D2 school in the Pacific West Conference. They return six seniors. If you want to get jealous and see how the students at Chaminade live, try this video. Chaminade's last Maui win was over another school in the Big East, a 52-49 first-round victory over Villanova in 2003. Hopefully, Chaminade's, um, dominance, over the Big East will end with Marquette. Marquette is guaranteed 3 games in Maui. If they dispatch the Silverswords Monday, they play at 6pm on Tuesday versus the winner of the LSU/Oklahoma State game (4pm on ESPN). For those who'd like to see a LSU/Marquette game because of former MU player, Dameon Mason, don't bother. DMas has a "viral infection in the muscles surrounding his heart" and won't play. Or something like that from CNNSI's Seth Davis. Talk about it here at MUScoop. Today is the first day of the National Signing Period when recruits can sign binding letters of intent with the university of their choice. Recruits can sign LOIs between November 14th and November 21st. Marquette is expected to sign four student-athletes this week -- a class that stands to be one of the more well-balanced groups Tom Crean has signed in several years. With this class, Crean recruited to every position on the floor (in terms of skill) and neatly replaced his outgoing seniors (Barro, Fitzgerald, Blackledge), and signed a talented PG to potentially replace Dominic James or to account for other roster attrition. Nick Williams, 6'4" SG from Mobile (LeFlore) Alabama: Williams was the first class of 2008 player to commit to Marquette. Williams plays for one of the most successful high school programs in the State of Alabama, and leads his Rattlers in defense of their 2007 State Championship. Williams is a big, strong guard in the Wesley Matthews/Tony Smith mold who should see immediate playing time next winter. Big Nick scored 32 points in LeFlore's season opener earlier this month. Joseph Fulce, 6'7" combo forward from Plano, TX via Tyler (TX) Junior College: Fulce originally signed with Texas A&M thanks to then assistant coach Buzz Williams. However, grades forced Fulce to a prep school where he reopened his recruiting after the coaching change in College Station. Soon after, Fulce signed an LOI to play for the University of New Orleans -- and then head coach Buzz Williams. Now Buzz is at MU, and Fulce is coming to MU. Third time lucky for Marquette? That's what Tom Crean is hoping for. Fulce will have three years of eligibility at Marquette. Tyshawn Taylor, 6'3" PG from Jersey City St. Anthony's. Taylor, who committed to MU over Georgia Tech, KU and UNC, looks to be the point guard of the future for the Golden Eagles. Because of the load of backcourt talent on his high school team, its doubtful Taylor will begin his career as a classically trained point guard but his strength and size mark a sea-change for the rather undersized stable of point guards currently on the MU roster. With Williams, Christopherson and now Taylor, Marquette should have have one of the bigger, more physical young backcourts in the Big East. Given Taylor's upside and heritage -- St. Anthony's, Bob Hurley -- he could be one of the most vital recruits for MU since Dominic James. Chris Otule, 6'10" 245 pound PF/C from Fort Bend (TX) Bush. The man in the middle. Finally. Otule was the final piece to the puzzle for the 2008 freshman class, and maybe its most vital component. While Tom Crean aggressively pursued Frank Ben-Eze (who ultimately committed to Harvard), he didn't fall for other bigs who expressed high interest in MU such as Maurice Sutton, Garrett Stutz or Josh Crittle. Crean waited until he found what seems to be a player with better tools, more potential and higher upside. Although Otule only averaged 5 ppg as a high school junior, that does not seem to be an indication of what to expect down the line. Check out this Q/A with Jim Hicks for details. Tonight, Dominic James stands at 991 points, and should hit his 1,000th point. When he hits that milestone, let's stand up and show him some love. He still has a ways to go to hit MU's top 25 scorers, but will be there right around when the Big East season begins. If DJ hits 15 ppg, he'll end the year inside the Top 15. Todd Rosiak reports that with Mbakwe and Christopherson out, Crean is looking to add a walk-on or two to add bodies to the practice sessions. So, if you see a 6'8+" guy walking around campus, could you direct him to the Al Center? Thanks. Mr. Basketball Wisconsin, freshman Scott Christoperson, will miss an undetermined amount of time following knee surgery Saturday morning. Scott underwent arthroscopic surgery to his right knee Saturday to repair a pre-existing injury to his meniscus. He will begin the rehabilitation process immediately and is expected to return in 2007-08. "We felt surgery at this time was the best option for Scott, not only for this season, but his long-term future as well" Crean said in a release. Ouch! First Mbakwe, now Christoperson. One more, and MU gets a free set of steak knives at the Surgery Center. The release suggests Scott will be back this season, although the debate will rage on whether he should red-shirt, since he hasn't played in any regular season games yet. Jim Hicks is the foremost high school basketball expert in the greater Houston area. 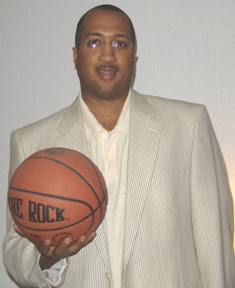 Jim is the editor of RCSSports.com, the online hub for Houston high school basketball. So, when Marquette secured commitments from a pair of Houston-area products there was only one place to turn to learn more about Chris Otule and Erik Williams. Why did Chris Otule fly under the radar for such a long period of time? With so many elite summer teams from the Houston area, it's very common for certain teams to get more exposure than others. As a result, the laws of averages finally benefited Chris with the Houston Lynx program as they participated in the George McClellan Invitational (July 14-15th) in Houston. Over five dozen D1 coaches were present to witness Chris go 'bonkers' on the boards during the Lynx's impressive win over the heavily favored Adidas sponsored T Mac All Stars. To many college coaches, July 15th was the official coming out party for Chris Otule. Otule sounds like a raw talent. Can you describe his game? Raw in the sense of miles on his tires, or in hoop terms - minutes played against high caliber competition. I truly believe that year to year, some kids get better and others don't. He has developed into a very dependable rebounding force. On the low post he's no longer waiting for the double team. Chris is getting the rock and making his move. It takes a certain type of attitude to get into that mode. You currently list Otule as the 15th best player in the Greater Houston area for the 2008 class. The buzz around Otule's upside has MU fans excited -- but is he a reach for a Big East program? The key word is 'upside', because it is currently Chris' most intriguing asset. One very important thing to digest is the fact that Greater Houston set a national record in 2006 with the most seniors from a single city (43) to pledge / sign with D1 schools. Not New York, not LA, or any other city have exceeded that number. Last season we had (38) to ink with D1 colleges totalling (81) during a two year span. Therefore, if those players were lined up along a wall, #43 would still be a Division One player. In an effort to allow those stats a chance to soak in, think of how many D1 signees were from your state within the past season. In a city where the talent is so tremendous, somebody has to be #40, somebody has to be #25, and somebody has to be #15. However, applying the 'Bell Curve', the #15 player in Greater Houston could very well be #3 in the entire state of Utah, New Mexico, Idaho, or even Wisconsin. Who is the better player, Otule or Dwight Miller (whom MU also recruited)? Two different positions. Miller is a face up forward who can guard the perimeter. Chris is more productive closer to the basket. Right now, Miller is more athletic and is a bit more developed. However, Chris is a flower that is just beginning to open up. In today's recruiting world it's almost like being on Wall Street - 'buy the rumor, sell the fact'. Right now he's a poor man's Emeka Okafor. Heck, before his 12th grade season in 2000-01, even Emeka was a poor man's version of Emeka Okafor. Do you expect Otule to contribute as a college freshman? Hard call. It depends on what type of season he has under a former D1 coach at Bush HS. I think many are speed balling past the facts that Chris is currently creating a resume for himself. Prior to this past July, he was known as a supplemental big body who only averaged 5ppg on varsity last season. Sure he's 1,000 times better today, but the bottom line is the bottom line, and there aren't many bodies like his around. Otule plays for a legendary coach in what has historically been one of the state's best districts. How does Otule's team look this season? Coach Ronnie Courtney is a living legend in the high school coaching ranks. His Willowridge HS team (featuring TJ Ford, Daniel Ewing, and Kenny Taylor) basically ignited the new revolution of recruitment for Greater Houston players. I have Bush HS picked to finish 3rd in this very tough district behind Hightower HS (featuring Garland Green - brother of NBA dunker Gerald Green) and defending champ Elkins HS (featuring Washington recruit Elston Turner - son of Houston Rocket asst coach). Erik Williams' verbal came as a big surprise to many. What are your impressions of his game? He's long, and long and lanky wings are in style like diamond chains in a rap video. Eric has improved so much over the past two seasons. He can stick the baseline jumper and even extend out to the curve. He rebounds well, and runs the floor even better. His high school coach John Harmatuk truly believes in the kid's ability to excel. When a HS coach loves a kid that much, that's a very good sign toward the confidence of the player. Is Williams a true SF, or can he play multiple positions? We're talking about an 11th grader. He still has this season and the next before establishing a true position. But as of now, he's a wing forward who'll have to play mostly on the inside with his HS team. During the summer, he'll get to freelance more on the perimeter and stuff like that. Was MU in on these kids before Buzz Williams joined the Marquette staff? I doubt very seriously that Marquette was anything more than Dwyane Wade's old school before Buzz arrived. Actually, after the results of Karon Bradley (from the same HS as Erik Williams), it was a very long shot for you guys to land another kid from that very same high school, especially an underclassman. That just simply proves the impact of pre-existing relationships in recruiting. Do you expect Marquette to continue to actively recruit the greater Houston area? Is MU looking at other local kids there? As long as Buzz's real name is Brent, he'll be stalking the hoop scene in not only Houston, but Dallas, San Antonio, and Austin as well. Some coaches may not want the names of their target recruits released prematurely, so I'll stray away from listing their names. Jim Hicks is the editor of RCS Sports www.rcssports.com . Also, Jim can be seen (not just heard, but seen) on the nation's only LIVE high school basketball Internet video talk show. "The Basketball Show" airs every Monday 9pm -10:30pm CT on www.houstonsports.com . The Big East announced today that beginning in 2009, the Big East Tournament will be expanded to include all 16 teams. Currently the league's top 12 teams punch a ticket to MSG. The Big East Basketball Report is once again polling all Big East bloggers for their annual Big East pre-season predictions. Look for the Big East Basketball Report to post the aggregated prognostications later this week. There is essentially no difference between teams #4 - #10 in the poll above -- the league is remarkably balanced and it would not surprise me to see any one of those seven teams deliver an upside surprise this season. Syracuse in particular should be fun to watch -- loads of young, athletic talent that could vault the 'Cuse into the top tier of the league. Some might think that having both PC and ND in the top five is a reach -- maybe so, but I gave the nod to these squads based on experience. I can't believe a Jamie Dixon coached team could finish 10th. Of course, if not Pitt, who --- UConn, West Virginia? The league remains loaded. Finally, choosing All-Big East teams is nearly an exercise in futility........the league is just so deep, inevitably very talented players are left off of any list. For example Darris Nichols, Jerome Dyson, Doug Wiggins, Hasheem Thabeet, Sharaud Curry, Randall Hanke, David Padgett, Anthony Mason Jr, Eugene Harvey, Levance Fields, Mike Cook, Rob Kurz, Da'Sean Butler, and J.R. Inman are just some of the additional players deserving of league-wide notoriety. Mark Miller from the Wisconsin Basketball Yearbook and Wishoops.net is reporting that Marquette has offered 6'5" sophomore G/F Marquis Mason of Madison East High School. MU is the first program to offer Mason. In addition to his stellar athleticism, Mason’s length and toughness on both ends of the floor are traits that impress collegiate recruiters. Mason is an outstanding shot blocker and rebounder, though he'll likely need to develop a perimeter shot while also continuing to improve his ball handling and moves to his right. Miller notes that Marquis Mason is the third player from the Wisconsin high school class of 2010 to receive an offer from MU, joining 6'11" Evan Anderson (Eau Claire North HS) and 6'6" SF Flavian Davis (Wisconsin Lutheran HS, Milwaukee). Information on how to purchase the latest Wisconsin Basketball Yearbook can be found here. Milwaukee – “The Tom Crean Show” finds a new television home this season as the 30-minute program moves to Time Warner Sports Channel 32 in 2007-08, with the first broadcast scheduled for 5 p.m. Thursday (Nov. 8) night. Dennis Krause will host the show, which will feature interviews, highlights, player features and behind-the-scenes access to the nationally ranked team. The show will air during its regularly scheduled time slot of 5 p.m. CT on Thursday nights and re-air several times over the course of the week. The debut edition will be replayed Nov. 8 at 10:30 p.m., Nov. 9 at 6:30 p.m. and 9 p.m., and Nov. 10 at 7 p.m. The Golden Eagles welcome IUPUI to the Bradley Center Saturday night at 7:30 p.m. for the Pepsi Season Opener. The Pepsi Tip-Off Luncheon is set for Nov. 9 in the Monaghan Ballroom of the Alumni Memorial Union. The reception begins at 11:15 a.m., with lunch and a program slated to start at Noon. Cost is $35 per person. For more information, please call Sarah Claus at (414) 288-4785 or sarah.claus@marquette.edu. The “Tom Crean Show” radio program also debuts this week with its first installment Monday night from 6-7 p.m. CT at Mo’s Irish Pub on Wisconsin Avenue. Nov. 5 will mark the first radio broadcast and the show will continue through March. Tentative show dates, subject to change, are Nov. 5, Nov. 26, Dec. 3, Dec. 10, Jan. 7, Jan. 14, Jan. 21, Jan. 28, Feb. 11, Feb. 18 and March 3. Not to dilute the great news of the Otule signing, but there are a couple other developments today that are of interest to Marquette fans. First and foremost, Marquette great, Doc Rivers' father passed away in Chicago today. Grady Alexander Rivers Sr. was 76. Please keep Doc and his family in your thoughts. Second, Lute Olson of the Arizona Wildcats (#17) is taking an indefinite leave of absence. Former MU coach Kevin O'Neill has assumed the head coaching duties. According to Todd Rosiak, Chris Otule, a 6-foot-10 center from Fort Bend Bush High School in Richmond, Tex., has orally committed to MU. "Chris is probably one of the fastest-developing big men I've been around," said coach Ronnie Courtney, who is in his first year as coach at Fort Bend Bush after a six-year stint as head coach at Division I Texas Southern University. "Last year he had a season where he didn't play a whole lot, but got in here and had a great summer and came back to school and is improving as we speak. A very mannerable and intelligent young man, I can tell you that." ...Otule's commitment puts MU over the scholarship limit heading into the 2008-'09 season, as its three available tenders have already been committed to Fulce, Nick Williams and Tyshawn Taylor. On Sunday the Marquette Golden Eagles will sort of kick off the 2007-2008 campaign with an exhibition game against Northern State University. Tip-off will be at 6pm CST at the Bradley Center. 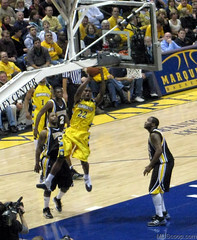 After analyzing Sunday night's matchup, I'm confident that Marquette will win, even without Trevor Mbakwe. Why? This is a classic trap game for Northern State. NSU played at Iowa on Saturday night then squeezes in the Marquette tilt on Sunday - - just days before their big battle with Black Hills State. FYI, Northern State University is located in Aberdeen, SD, and has an enrollment of 2,200. Wolves' basketball has been around 106 years, and they currently play in D2's Northern Sun Intercollegiate Conference. Here is the GoMarquette release on the game. Earlier this week the NCAA released its annually updated list of graduation rates for athletes and Marquette University was among the nation's best. In the most recent NCAA report, the average Division I graduation success rate (GSR) is 77%. Marquette blew that away with a 95% GSR! Only the domers scored higher in the Big East. In terms of basketball, the national Division I average GSR was just 61% (DePaul 'helped' there with 36%. LOL). Marquette basketball clocked in at 89% for the assessed time period. That's an exceptional performance by Marquette University. Congratulations. The Chicago Tribune has a full report here. To view Marquette's complete GSR, here is the full .pdf file. The Tom Crean Show begins on Monday, November 5 on ESPN Radio Milwaukee. Details are available here on GoMarquette.com. The show will be streamed on gomarquette.com and ESPN Milwaukee. BTW, here's all you need to know about Tom Crean. Houston-area big man Chris Otule will visit MU this weekend. Otule is a 6'10" PF/C from Fort Bend Bush High School. Otule also plays for the Houston Lynx club team in the area. As this blog stated a few weeks ago, commitments from Tyshawn Taylor and Chris Otule would be a terrific recovery for MU on the recruiting front. One down, one to go. Just for kicks I checked out DraftExpress for their Big East preview. Do any of you think Damian Saunders will help Marquette this season? Comical.